This term, I'll host weekly OPEN OER HOURS in the my office CEN 267 in the library. Come ask questions/chat with me about your project. $155,550 per term and counting! 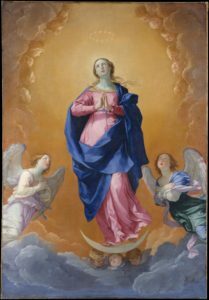 The Immaculate Conception by Guido Reni, CC0 and downloaded via the Metropolitan Museum of Art’s digital collection. The Metropolitan Museum of Art has just changed the licenses of approximately 375,000 images to Creative Commons Zero, or CC0, licenses. This places the images into the public domain and allows for their free download and unrestricted use. Search The Met’s collection of public domain works. For more information on this policy change, read the full story “Met Museum Makes 375,000 Images Free” by Joshua Barone for the New York Times.